~ The Frugal D.I.Y. 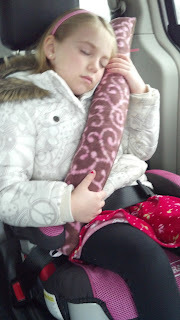 Mom ~: DIY Travel Seat Belt Pillow For Kids - Tutorial! I'm so excited to share my first sewing tutorial with you! I have been selling these on Ebay for a while and I can't believe how popular they are! They take just under an hour when you first start, but you get faster as you go! I saw some very tiny versions of this on Amazon. Not gonna cut it for us, so I made my own! 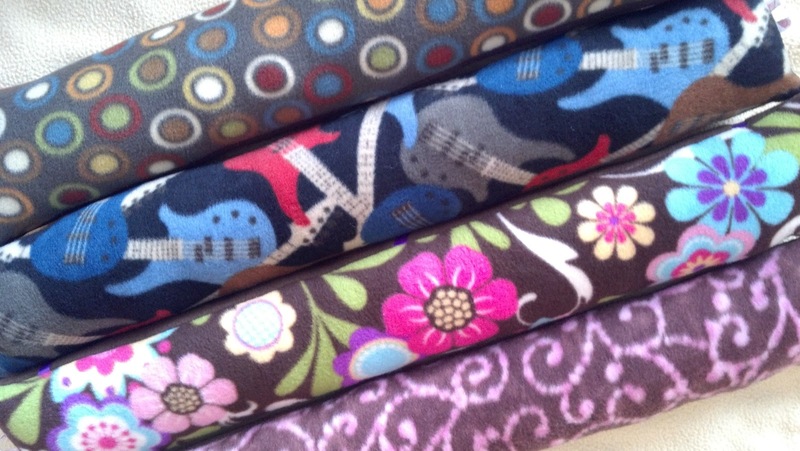 2 pieces of fleece cut to 26"x6" each...choose your favorite patterns or solids! My Walmart had clearance! Now, fold one of the pieces of fleece in half (right side up) to find the middle point of the pillow and place the first ribbons. (I use the solid piece as it is easier to see what I am doing!) 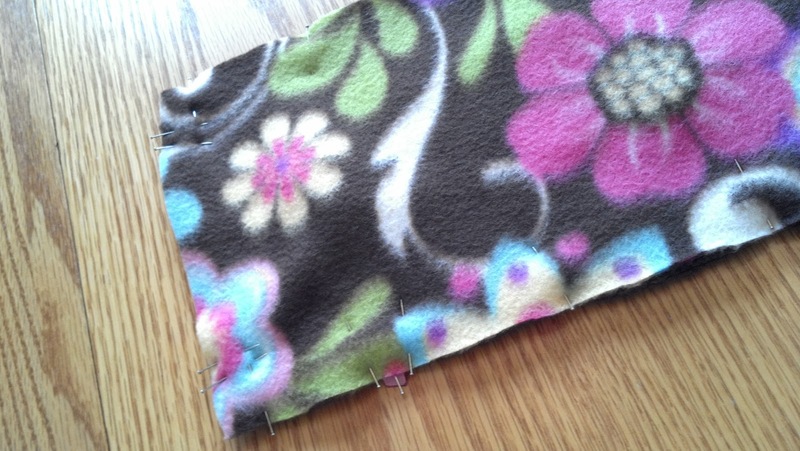 Place the ribbon right-side up at a right angle to the long side of the fleece. 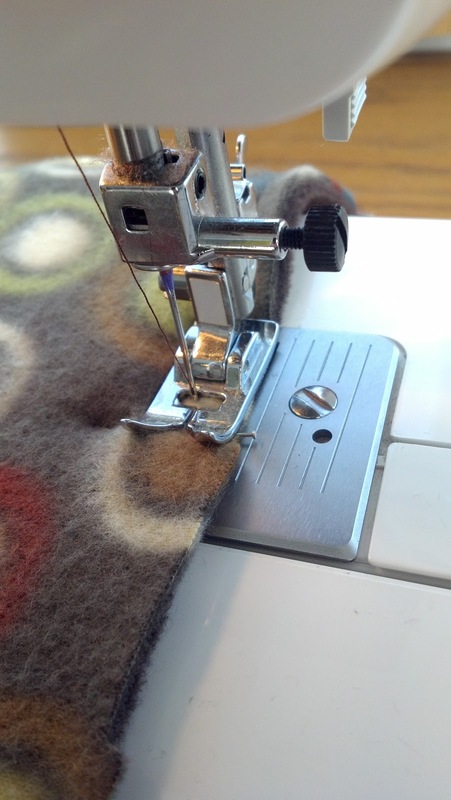 Put the edge just overlapping the fleece slightly as the fabric may move slightly when sewing. The long part of the ribbon should be laying toward the middle of the fabric. Place the second ribbon at the middle point directly across from it in the same way. Now, measure approximately 2-3 inches in from either side of the ends of the fleece to see where the last 4 ribbons will go and attach them the same way. 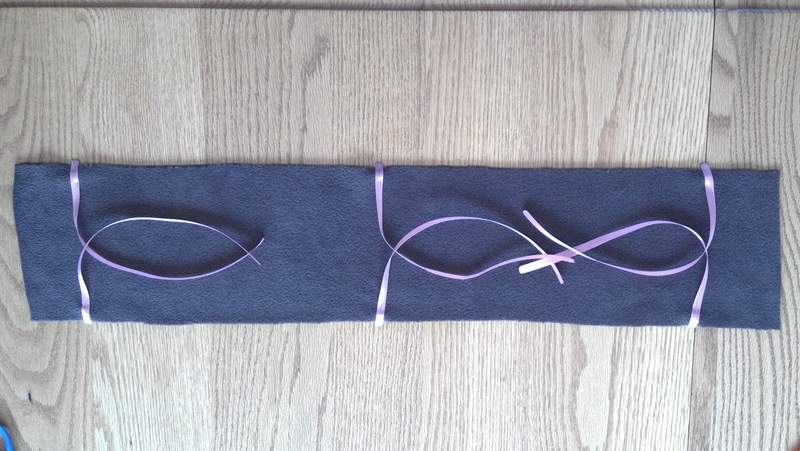 Now, make sure that all of the ends of the ribbon are moved in a horizontal fashion so that the long ends don't get caught when you are sewing the pieces together. After your ribbons are out of the way, gently line up your second piece of fleece with right-side down on top of the ribboned one. (So, right sides are together.) Pin all the way around except for the middle 3/4 of one side as this is where you will turn it inside out. 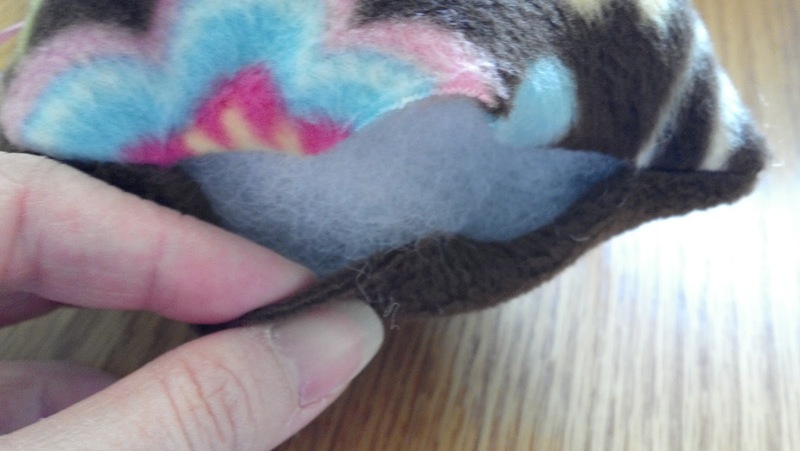 I make sure to pin the second fleece on either side of the ribbon to ensure that the ribbon doesn't slide side to side during sewing. 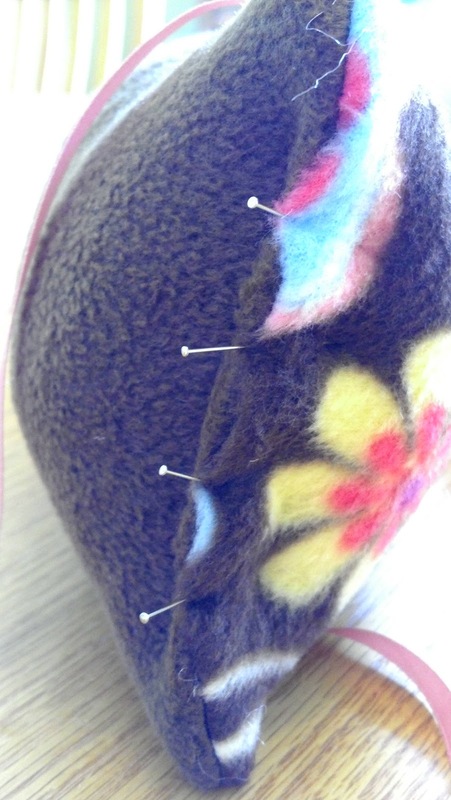 On one short end, I use 2 pins to mark where to start and stop my stitching...or else I would sew it shut without thinking! Sorry, my photo with the flower fabric disappeared! Cut the threads and turn right-side out! Hopefully you didn't catch the long sides of the ribbons like I did the first time! Now, just stuff with your polyfill! Remember that it is difficult to move the fill around after you've sewn it shut. Make sure your fill is smooth by using smaller "clumps" and spreading them evenly with your fingers. 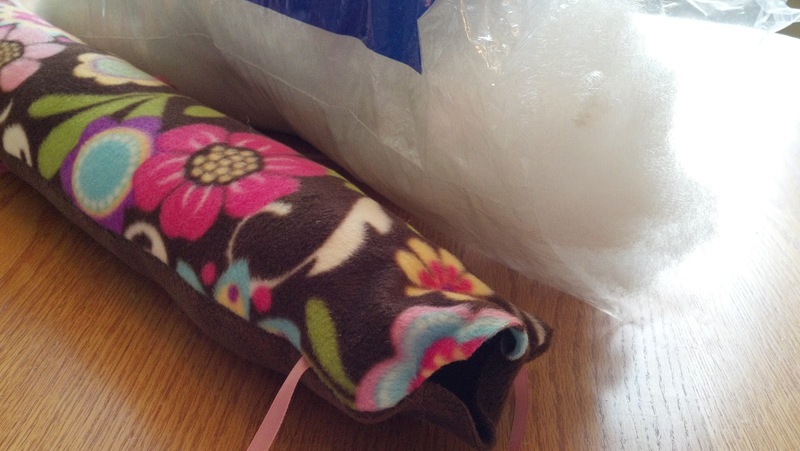 After your pillow is full, turn the open ends under the 1/4 inch and pin shut. You can hand stitch them or maybe you can manage to use your machine - I've finally mastered the machine! Now, sit back and enjoy your new creation - the kids LOVE them!!! Are you making this pillow for a surprise? Check out how the Frugal DIY Mom is helping others plan surprise travel including Disney surprise, blind booking and other surprise vacations! Thanks for posting your travel seat belt pillow tutorial. I think I might try hand-sewing one, since I am not handy with my sewing machine yet. Are you selling any of the ones you have? I would love one already finished since we will be traveling soon. Oh, Kerri! Forgive me...I just figured out this whole replying to comment thing! :) I hope you were able to make one? And did you have a great trip? :) Thanks again for your comments! Thanks so much for sharing this! I am usually more comfortable with power tools than a sewing machine but your instructions were easy to follow. It will be a nice little something extra for my niece, who has a birthday in just 2 days! I am sure the ones you sell are much better crafted than mine but I must say....I am pretty darn proud of myself. Thanks again!!! This is very useful and essential for kids to travel comfortably. I think would be even useful for use in plane seat belts! A great idea! AND, we now use it in the umbrella stroller...we tie one end to the top near the handle and the other to the frame of the seat! Thank you so much for sharing. I'll make one for my son. We're going to have a long...long... traveling next month. I was curious as to how it turned out! AND I hope you had a GREAT time traveling! Where did you go? Thanks for sharing. My son falls asleep every time gets in the car. I dread that seat belt being against his neck. This is a great DIY birthday gift idea. Thanks again! You are so welcome! It is actually a blessing that your son falls asleep so easily in the car...my son, not so much! :) Did you get a chance to make one? We've been vacationers for several years and we've confronted the aggravation of a distressing journey wherever you have to rest however, you just cannot with no journey cushion. That's why we produced this site to simply help all of the vacationers to locate a journey cushion to generally meet their requirements and create your potential journey better! I'm aware this is an older blog post, but, I just wanted to thank you for sharing it! I just made one in less than 20 min with 3 toddlers in the same room lol. It's perfect!! This is not safe at all. Anything added to seatbelts, especially for children, is harmful. What isn't safety tested with the seatbelt should never be placed on the seatbelt.